When you use double-side foam servo tape (like 3M attachment tape), always clean the servo case with some rubbing alcohol and then apply some clear tape to the case before applying the foam tape. For a proper bond, make sure the surface you stick the servo to is also clean. If your servo case is dirty and has left-over foam tape adhesive in it, be sure to clean it before reinstalling the servo. 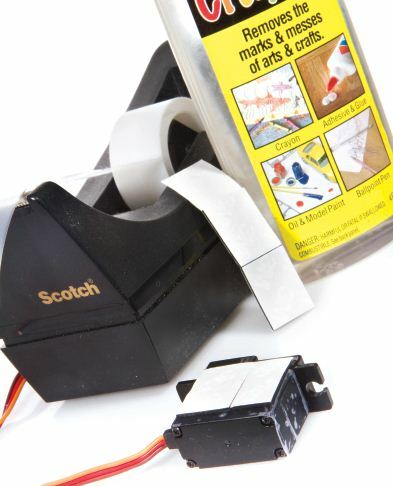 “Crayon Away” (available at Wal-Mart) works great for removing that leftover tape residue.